Image caption Would more people have bought a BlackBerry if it had been called a MegaMail? Choosing a name for a new business is perhaps the first big decision that the founder has to make. How vital is it to pick a good one? When Mikael Cho told his friends he had moved to Montreal to start a company, they would inevitably ask him what he had called it. To which he would reply: "Ooomf." His friends would then say they loved the name, but few if any could guess the correct spelling. He quickly realised he might need to rebrand. Start-ups are like newborns and, just like children, the wrong name can scar for life. Imagine if Google had been called BackRub, as it was dubbed in its first incarnation. "Some words have characteristics that fire the imagination and generate interest," says David Placek, who founded the brand-name consulting firm Lexicon in 1982. "Don't underestimate the power of a brand name to achieve things on its own for you." Lexicon, based near San Francisco in California, has helped name an assortment of well-known consumer brands, including Pentium for chipmaker Intel, PowerBook for Apple, and Dasani for Coca-Cola. In 1998, a small Canadian company went to Lexicon seeking a name for its new high-tech mobile phone which would send emails. The firm from Ontario was torn between names such as MegaMail and ProMail. Mr Placek and his team had other ideas. After free associating words, someone said "strawberry" to convey enjoyment and freshness. Then someone else suggested "blackberry". The Canadian executives from Research in Motion (RIM) chose the latter, and going with Mr Placek's suggestion, settled on adding two capital letters, and called their device the "BlackBerry". 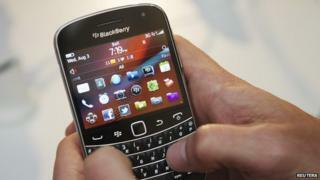 RIM - itself now known as BlackBerry - has gone on to sell more than 33 million units of the BlackBerry in its various guises, despite being overtaken in recent years by Apple's iPhone and handsets using the Android operating system. Today, Mr Placek says it has become "extraordinarily difficult" to create a new name for a product or company. When Lexicon launched 32 years ago, it had just five employees, and some freelancers, brainstorming ideas and coming up with names. At the time there were about 15,000 trademarks and associated patents relating to US technology companies. Now there are almost 700,000 for Lexicon, whose workforce has grown to more than 20, to wade through. And thanks to the increased globalisation of business, it now has to employ the services of linguistic experts around the world to make sure that a suggested new name for a product or company does not cause a faux pas in a different country. Mr Placek adds that he has even invested $500,000 (£290,000) on researching how well each letter of the alphabet performs in a brand name. He says that "Z" is one that resonates particularly well with consumers. Mr Cho's business is an online marketplace, where designers and developers of websites and mobile phone apps can pitch for work. Setting up the company in February 2012, he initially chose the name Ooomf because he wanted something quirky. "We eventually landed on Ooomf because we thought it was catchy and memorable," he says. "It was definitely memorable. But definitely impossible to spell." So earlier this year Mr Cho changed the name of the company to Crew. "The definition of a crew is a group of persons involved in a particular kind of work or working together," he says. "This is what our company does - connecting people together to do great work. It was short and easy to spell. And represented what our company stood for." Lloyd Armbrust, who is based in Austin, Texas, is another boss who ended up changing his company's name. He founded his business Seeing Interactive in 2010 to help newspapers turn print adverts into online ones, without the need for developers or sales representatives. Did he think long and hard about about what the name would mean to his own sense of self and his customers? Not really. "We named ourselves Seeing Interactive mostly because [the web name] SeeingInteractive.com was available," he says. Mr Armbrust says that because his company was not selling to consumers he thought "the name would not matter, but it turns out that it did". "It was hard to say, long to spell, and people had a really hard time understanding what we did." So he and his team asked family and friends for help coming up with a new name for the firm. In the end Mr Armbrust decided that the word "local" needed to be in the new name, and that it should "sound like a brand". So after checking their options against what was available in terms of trademarks, patents and domain names, he and his colleagues renamed their business OwnLocal in 2011. Mr Armbrust says the new name seems to have made a world of difference. "Without the name and brand I honestly think people would have a hard time standing behind us so easily." Lexicon's Mr Placek has some practical advice for finding the perfect company or product name. He suggests beginning by looking at the competitive landscape. "Get all of these names up on a wall and commit to not copying them," he says. Image caption Facebook was originally called "TheFacebook"
Then Mr Placek says the business has to work out what story it wants to tell and why. And only then is it time to start generating names. Among the recent names that Lexicon has helped come up with, Mr Placek's favourites include FlyWheel, a taxi hire mobile phone app, and e-book seller Zola Books, which uses the supposedly popular "Z" letter. Mr Placek is also a big fan of mobile messaging service WhatsApp. He is, unsurprisingly, also very complimentary of the names Apple chooses. "Take the iPhone," he says. "They took a household word and by putting one letter in front of it, it ends up being game changing."